Unfortunately, I can’t shred ALL papers. There are some papers in the filing cabinet that actually need to be kept. I have developed a list of these essential papers, and I would like to share it with you. Before we get to the list, though, I need to start by saying that cross-cut shredders that are able to destroy credit cards and staples are the best for personal security reasons. As a result, I recommend the following: Fellowes PowerShredder PS-77Cs for higher-volume shredding households and the QuikFinish ShredderShark SH8CDCC for lower-volume shredding households. Also, if a lawyer, accountant, or special circumstance directs you to retain more information or paperwork for a longer period of time, you need to follow that advice! What I have compiled is just a standard list that should be tailored to your specific situation. If you’re interested in learning what documents can be stored outside your home in a safe deposit box at a bank, I highly recommend reading the following article: Safe Deposit Boxes. I strongly disagree with destroying credit card receipts and cancelled checks. At university, our law professor strongly advised us to not allow banks to stop sending us cancelled checks. He said that these were valuable legal documents that can come in very handy in disputes. Stephen — If the check or charge is in dispute, then I would strongly agree with keeping them. What was the rationale, though, for keeping them if they are correctly recorded on your monthly bank statement without any dispute? I highly recommend getting yourself off of any mailing list that’s sending you credit card offers. Simply being on those lists exposes you to a risk of identity theft. Plus, if you don’t get that mail anymore you don’t ever have to deal with it at all! There’s a great set of resources for getting yourself off of mailing lists of all kinds over at http://www.newdream.org. Unfortunately, the web site appears to be down at the moment, but hopefully it will be back online soon. Matt — You also can check out this post and this one from the Unclutterer website if the link that you provided isn’t working. Both posts have great ideas for reducing junk mail. I learned the hard way that you should never shred your receipt for the shredder you just bought! I believe the rationale for not shredding receipts and cancelled checks has nothing to do with whether your _bank_ disputes them or not. It has to do with the fact that these can be very useful records of payments for services, particularly in the case of cancelled checks. If the other party later comes back and attempts to claim that you didn’t pay them, or that they didn’t accept your payment, having a cancelled check on hand with their signature on it is often much better for proving otherwise than some anonymous line in a bank statement. Would the digital images of the checks in question hold up in court the same way the paper versions would? I’ve turned to scanning all of my records into pdfs, and my bank keeps digital images of all my checks (I actually used these records in a dispute with my landlord earlier this year)… anyone? I’d just as soon not have the extra paper around. 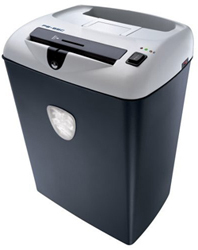 I just want to amend the recommendation of the “Fellowes PowerShredder PS-77Cs” for higher volume shredding. The tech specs on Amazon’s site say that the recommended capacity for this machine is 600 pages per day. That’s about a ream of paper which sounds like a lot until you go to shred a year’s worth of paper and realize that you are going to be spending DAYS shredding it. I find that even mid-grade consumer shredders (like the one recommended) seem to overheat after only 45 min or so of shredding. I’ve found that in practice the per-day recommended capacities for mid-grade shredders tend to be conservative. I’ve done a lot more than 600 pages in a day with my PS-65, which is a lower-rated machine than the PS-77Cs. Besides, how often will you be doing more than 600 pages in a day? After 7 years, you can get rid of tax return/documentation. The IRS only requires up to 7 years of history and cannot ask for anything further back. I would also recommend having your accountant hold onto copies of your tax documents, since they would have a more complete record than you. So don’t shred your US password unless you want to stand in line to get a new one. Beyond having to stand in line, there are other good reasons to keep the old one until the new is ready: there is an extra $30 “execution” fee if you apply in person that you don’t have to pay by mail. You also don’t have to supply anything but the expired passport when you mail it in; if you shred it then have to go in person to get a new one, you have to provide several forms of ID in order to get it. Moral of the story: Keep the old one until you have the new one in hand, but after that, shred away. I keep checks and bank statements for the 7 year period. Not just for tax purposes, but to resolve disputes with companies who ‘forget’ you paid them, and come back a year or so later saying you owe them money and interest. You can pull out your check, and mail them a copy of the front and back (showing their endorement and bank of deposit). Also, bank statements these days have more than just checks and deposit records, they have ACH (Automated Clearing House) entries, wires, and other useful info that you may need for not just tax, but legal purposes later. If you’re like me, you have to now go through your bank statements with a highlighter to find ACH/wire/digital check entries to log for tax purposes. If audited, you can use this highlighting as proof as to what your source info was for your tax reporting. For that reason alone, I keep my bank statements. There is no improvement in security for having one year’s worth of bank records vs several. If you are robbed, and the burglars find your ‘current year’ bank statements to commit ID fraud, it won’t help them any more if they find 1 year of data or several.. you’re screwed either way. Why is it so risky to keep expired credit cards? None could use them to buy anything anyway. Asdf — (Is that your real name? 🙂 Your old account number, which is found prominently on the front of your old credit card, could be used by someone on a falsified credit application. As a recovering pack rat, I do have to say that I am glad that I kept receipts for a very long period. I was in a custody dispute in which the parties fighting me for custody attempted to claim that I never came to visit my children during certain periods. I was able to produce receipts showing where I had been on certain dates – gas station receipts because I made sure to fill up close to their home, grocery receipts when they claimed I didn’t offer any support for my kids, copies of cashed checks that had cleared my bank for the same reason, etc. I’m certain that most people don’t have to worry about that. But I believe in keeping a clear paper trail wherever possible in the event someone ever accused me of something that could be easily disproved. I don’t have to worry about it as much any more since I was successful in my custody claims for the aforementioned reasons – so I urge anyone to ask themselves if something would come in handy before shredding. Keep your credit card and check receipts for returns & warranty purposes. Expired credit cards are dangerous to keep because while they may not be useable, the information on them can be used to request new cards or open new accounts. That list is not safe. For example, you may well need your expired passports to document when you were out of the country. While you can safely shred some things, the best thing I found for dealing with “might be useful some day” is to put it into a big box labeled by year. On the rare occasion that I need something, I can dig through that and find it. Tom, your comment doesn’t make sense. If you’re out of country, how are you accessing your documents at home? The passport agency does not request you to relinquish all of your old passports when applying for a new one, they only request your current passport. However, if you feel that you must keep hold of your dozens of old passports, you should store them in a safe deposit box instead of in your home. If someone were to rob you, your expired passports and expired credit cards would be a gold mine for that robber. The reason to shred unnecessary papers is to do everything that you can to protect yourself against identity theft. If people have a special circumstance, like is mentioned in the post above, then they need to use their brains and do what they need to do instead of blindly following the list. When I replaced my cheap shredder with a better one, I moved the old one to the garage. It and the recycling bin sit right next to my car door. Now when I get out of the car with a handful of junk mail, anything with name and address goes to the shredder and generic pages go to recycling, not into the house. I bought the QwikFinish ShredderShark SH8CDCC and the instructions do say to remove all staples. It seems solid and capable, but I think I’m going to take to a shredding store that big stack of old bank statements and other papers I’ve been saving, then use my new shredder for the day to day stuff. Thanks for a good post. It got me moving on shredding and disposing of old papers. I finally gave up on having a home shredder. The really good ones cost an arm and a leg. And if you have a large amount of shredding to do, they take forever and overheat easily. Instead, I found a local shredding company. It costs $6 to shred banker’s box full of papers, CD’s and what-not. I save all my papers that need to be shredded, and drop them off at the shredding company on the way to work. There are also shredding companies that will come and pick up papers at your house. It beats sitting dealing with the hassles of a home shredder. An expired passport makes a wonderful addition to a scrapbook – especially if it can be removed from the scrapbook so you can thumb through all the stamped pages and relive your journeys. Of course, that leads to a whole new category of clutter.